A few new color choices, perhaps. But that’s about it after a model-year-’14 revamp that brought updated styling and a host of new safety and convenience features. This popular seven- and eight-seat family hauler is rightfully lauded for its versatility and engaging driving experience, so don’t expect the Japanese automaker to mess with a solid seller and a critic favorite. Maybe because you’re the type who doesn’t like to buy an updated vehicle until you’re certain the bugs have been worked out. Lower-line 2014s did dump their five-speed automatic transmission for the six-speed formerly exclusive to top-grade models. And blind-spot and forward-collision-warning systems were among other new features. But this is Honda; first-year fumbles are rare. The only other reason would be to wait and see if the company offers its innovative HondaVAC in-vehicle vacuum on more than just the most expensive trim level. It’s not a bad idea if you want to take advantage of the new features without swallowing a model-year price increase. On the safety front, you can now get most versions with the company’s LaneWatch blind-spot camera. The most noteworthy addition, however, is the aforementioned onboard trash-suction system. It’s a parent-pleasing solution to the problem of debris-littered carpets and floormats. Grandparents love it, too. Highly unlikely. The 2014 revisions were limited to a modestly reshaped grille in a subtly reshaped front end that adopted weight-saving aluminum for the hood and front fenders. LED taillight inserts dressed up the rump, and the cabin got upgraded surface finishes and a new central controls stack. The general shape and appearance will be unchanged from this generation’s model-year ’11 debut. In fact, don’t expect significant updates until its next full redesign, likely as a 2017 model. The ’15 lineup should begin with the LX base model, followed by the better-equipped EX and the EX-L grouping with leather upholstery, and topped by the loaded Touring and Touring Elite. Again, anticipate status quo. The sole powertrain will almost certainly repeat as a 248-horsepower 3.5-liter V-6 engine and a six-speed automatic transmission. (The six-speed had been limited to the Touring and Touring Elite.) The engine will again feature the carmaker’s Variable Cylinder Management, which automatically shuts down two or three cylinders at cruising speeds to save gas. Front-wheel drive will undoubtedly return, leaving the rival Toyota Sienna as America’s only minivan available with all-wheel drive. And don’t look for a hybrid or pure-electric version anytime soon. Advancing to the six-speed automatic transmission enhances performance of a people mover that drives more like a big sedan than a large box. It accelerates easily to highway speeds and passes confidently. The ride can be a little on the firm side, but road manners arguably top the class. Expect Touring and Touring Elite to sustain their extra margin of handling thanks to their 18-inch wheels and tires versus the other trim levels’ 17s. It did for the models that moved up to the six-speed automatic transmission. But ‘15 EPA ratings probably won’t budge from 2014’s 19/28/22 mpg city/highway/combined. Probably not; there’s little to add. Standard equipment for all models will again include power driver and front-passenger seats, Bluetooth connectivity with support for Pandora Internet Radio and the ability to listen to SMS text messages. EX and higher versions feature keyless entry with pushbutton engine start, as well as the proprietary LaneWatch, which uses a video camera to reveal what’s in the right-side blind spot. The image shows up on the dashboard screen when at the press of a button or when the turn signal is activated. The EX-L has leather upholstery with heated front seats, lane-departure warning and forward-collision alert, and a refrigerated front compartment that can hold four 20-ounce beverages. A wide-angle rearview camera, navigation system and rear DVD entertainment are standard on the Touring. Touring Elites come exclusively with the HondaVAC, blind-spot alert, and an HD Radio receiver. The rear DVD system and navigation will be available on the EX-L as well, and, per Honda tradition, versions so equipped are priced as separate models. Any additional options will come in the form of dealer-installed accessories. The EX-L grouping has been the most popular, with the single best selling version the EX-L with Rear Entertainment. It takes its name from a DVD system with a 9 inch ceiling screen. The EX-L i with Navigation substitutes a voice-activated navigation system. The Touring Elite packs every available feature, including the vacuum and a premium DVD entertainment system with the “Ultrawide” 16.2-inch-diameter ceiling screen capable of simultaneously displaying two separate video sources. The LX will likely continue with seating for seven. 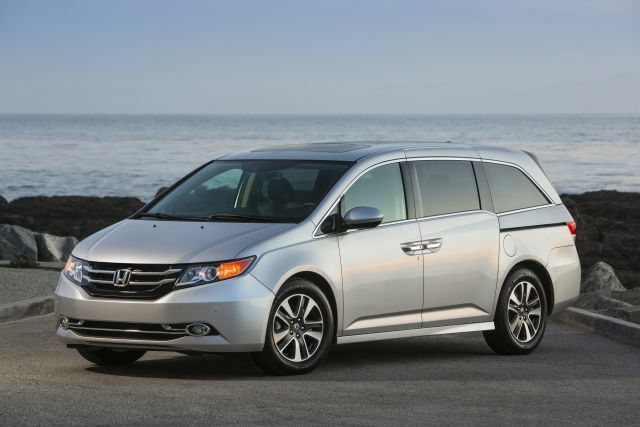 All other Odyssey models should remain among the few minivans capable of carrying up to eight. That’s thanks to a removable, 10-inch-wide cushioned section in the center of their second row. The outboard portions of the second row are capable of sliding laterally a few inches, creating enough width to fit three child safety seats; two more can be latched into the third-row seat. They’ll creep up, maintaining this as among the most expensive entries in its competitive set — but one adept at serving its upscale audience. These estimated base prices include the manufacturer’s mandated destination fee, which was $830 for 2014. Look for the LX to be priced around $30,000, the EX at $33,500, the EX-L at $37,000. With DVD entertainment or navigation, they’ll be closer to $39,000. The Touring should be priced around $42,500, the Touring Elite around $45,800. 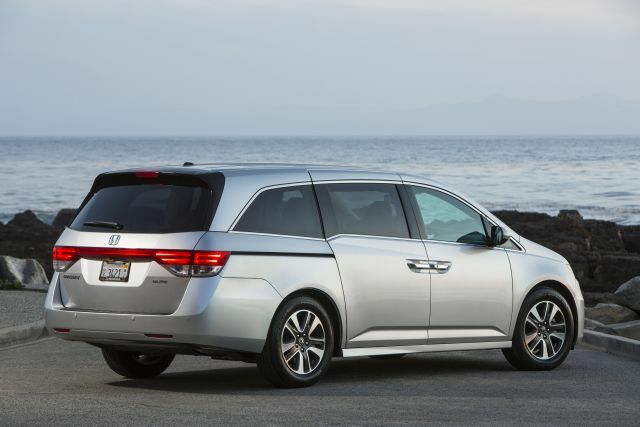 The HondaVAC is a first-of-its-kind feature that represents an innovative solution to a problem facing many families likely to buy a minivan. The vacuum is built into the rear cargo area and includes an extendable hose designed to reach every part of the cabin. It sports two interchangeable attachments, a removable canister and a replaceable filter. The system can run for up to eight minutes with the engine off or indefinitely when the van is running. It’s a shame this carmaker forces you to pony up for the top-shelf Touring Elite to get it. We hope it’s available on additional versions for 2015.